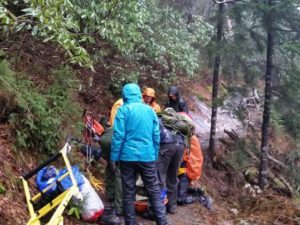 Rescue on Mt. LeConte (part II) - GetGoing NC! Yesterday, Jon Holliday of Cary recounted how an annual tradition for four hiking buddies — Pete Sprague of Asheville, David Sprague of Boone and Scott Duffy of Charlotte and himself — took a turn when Pete fell and broke a leg. Today, the rescue. Pete, wrapped in a space blanket, sitting under an umbrella and in a beach chair, awaits rescue. Photos by Jon Holliday. It would be three hours before a first responder could reach the scene, a dispatcher for the Great Smoky Mountains National Park told the hikers. 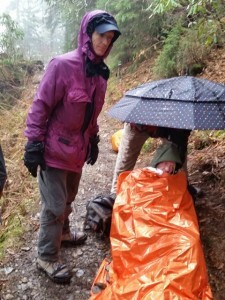 Though it wasn’t cold, the torrential rain meant keeping Pete warm would be a top priority. That’s where Mr. Silly from Saturday turned into Sunday’s savior. He happened by shortly after Pete fell; his beach chair was just what was needed to keep Pete off the wet ground and keep him from slipping into shock. The umbrella came in handy, too, as did the space blanket Jon had purchased just three weeks earlier. As predicted, Park Service Medic Les Kwiatkowski arrived about 1:30 p.m., three hours after Pete went down. A second medic arrived around 3:30 and administered the pain medication that would make Pete’s bouncy ride down the mountain bearable. A half hour later, more than a dozen rescue team members arrived with a basket litter and a wheeled Teton litter. They also brought gear for an overnight stay if conditions warranted. Rescuers get ready for the long descent down the mountain. It was 4:30. They had three miles of trail ahead of them. The sun would set in about an hour, and the wind and rain were picking up. Slowly, they began down the mountain. “The wheeled Teton litter had a single motorcycle tire in the center of an aluminum frame, with two handles and a hand brake on the back. On the front, a person would get inside a step-through bar on the litter — like you see when people are pulling rickshaws. These two people would guide the Teton litter and control the speed. Two people on each side of the litter would help guide it, lift it over obstacles, and keep it upright as needed. After a while, the team would stop and people would swap off with others when they were too tired to keep going. When the trail got too narrow for people to be on both sides, they would line the trail standing on the mountain sides and pass the litter from one person to the next. At times, they would hook onto the sled when there was a danger of falling themselves. Throughout the rescue, team members were calling out commands to ensure obstacles were seen before the litter got to them, to halt the litter if needed, and to control the speed of the transport as required. 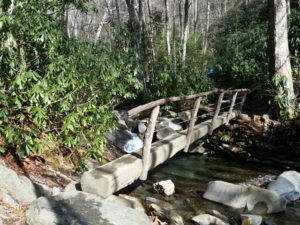 This quaint log bridge offered a scenic crossing going up the mountain, but on the descent, in a driving rain with the creek swelling, it provided some tense moments for the litter-bound Pete Sprague. Soon, it was dark and the wind had become more ominous. And there was the water. They made a brief pitstop in an overhang at Alum Cave Bluffs, swapping out headlamp batteries, grabbing a snack, catching their breath. Then they pressed on. At a series of steps at Arch Rock, Pete and his sled had to be belayed using a series of ropes set up by the rescue team. 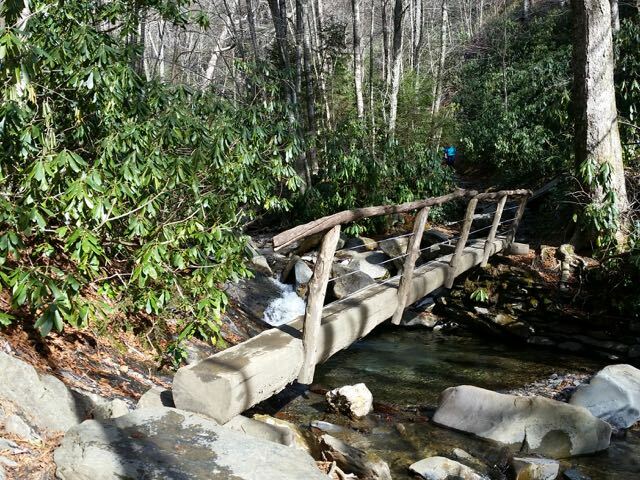 Once they’d passed that obstacle, another arose: a one-log bridge crossing common in the Great Smokies. “It was very tricky to lift the litter onto the bridge and keep the tire centered on a 18 inch wide log with a rail on just one side, with rescue personnel on the back and front and in the stream guiding the litter along when possible,” said Jon. It was the first of many such bridges they would have to negotiate in the last mile and a third. “One seemed like it was only 12 inches wide,” Jon said. “We finally made it to the parking lot and a waiting ambulance at 8:30 p.m, 10 hours after the accident occurred,” Jon said. Pete was transported to LeConte Medical Center and put in a full leg cast. Three days later he had surgery in Asheville. He’s expected to be off the trail for at least eight weeks. What might seem like a harrowing experience to some was, to Jon, just another adventure on the trail that was handled by following some common sense rules of hiking. Know where you are at all times. Knowing the trail as well as Jon did helped: they were able to let rescuers know their precise location. A map is essential, as is a compass. 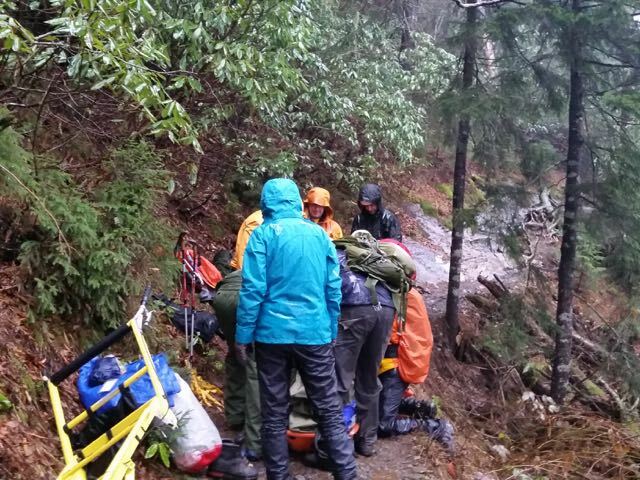 A passing hiker had an altimeter and was able to provide a precise elevation, which helped rescuers as well.